I’m not saying you should skip Prague! Not at all. But once you take in all of Prague’s beauty, despite the crowds of tourists, you might be ready for a town of a comparable charm, yet full of locals rather than tourists. Welcome to Olomouc, the 6th largest city in the Czech Republic. With Olomouc population currently sitting at 100,000, it’ll feel quite empty as opposed to Prague. 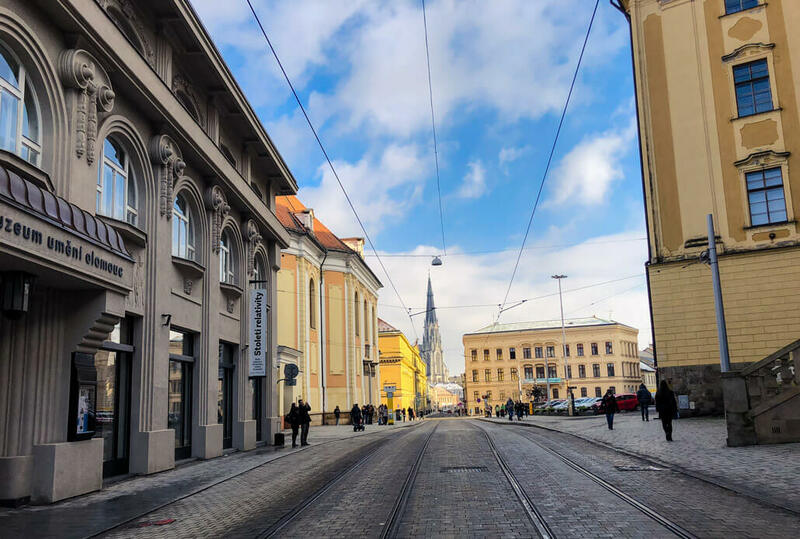 If you decide to travel to Olomouc, you might find it surprising how this city doesn’t receive more attention given its charm and the variety of sights and activities. There are many things to do in Olomouc and we’ll cover them shortly. But first things first. 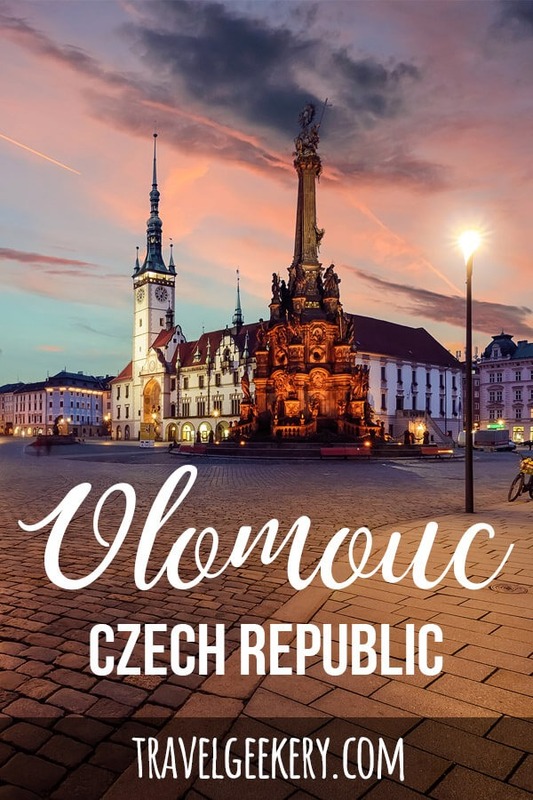 How do you actually get to Olomouc? Train: Olomouc train station is modern and easy to navigate and there are 3 train companies in the Czech Republic that you can use to get there. Regiojet: The trains are old but perfectly renovated. Regiojet offers great service and comfortable seating and it’s one of my favorites! Leo Express: Sleek black trains which provide good comfort and awesome food. I personally take Leo Express at least once a month. Bus: The Olomouc bus station is located right next to the railway station. You’ll have to take an underpass under a road, but it’s less than 5 minutes away. Convenient, right? I would say the bus is much less comfortable, and the less time you spend on the main Czech Highway, D1, the better. Plane: While there is an “Olomouc Airport”, it’s not meant for civil flying. You could land there if you have a private jet. Do you? :) Otherwise the nearest airport to Olomouc is in Ostrava, but it’s serviced from 80% just from Prague. The nearest full-on international airport is in Vienna, Austria. Car rental: If you’d like to discover some more remote areas in the Czech Republic, renting a car is a good idea. You can choose from these companies. Private transfer: There are a few companies that you can use. See below. If you don’t have much time to explore more of the country, you’ll want to take a direct train from Prague to Olomouc. You can travel by either of the three train companies mentioned above, but I recommend Regiojet or Leo Express, or Pendolino (SC) train by Czech Railways. They all provide wifi. 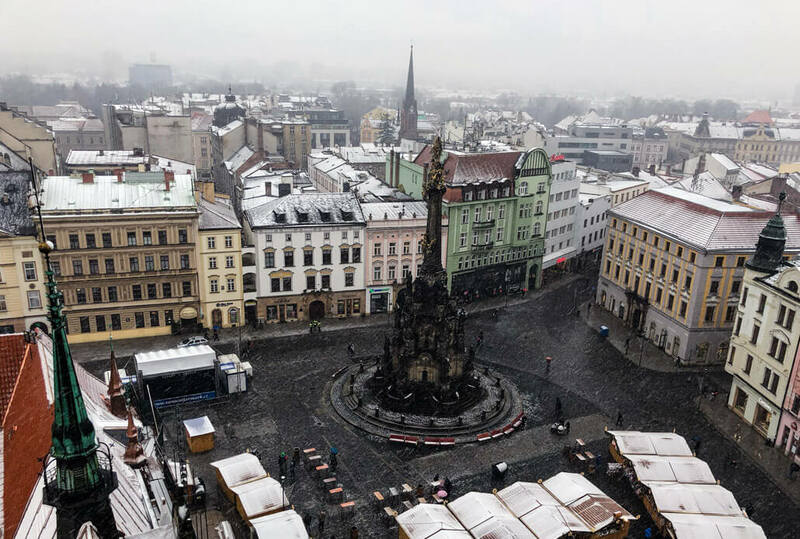 There is also the option of a private transfer from Prague to Olomouc. Click here to see the current price and availability. If you are coming from Brno then I’m so glad to hear you visited the Moravian capital as well! How did you like it? :) The Brno to Olomouc train is shorter, but there the journey is not direct. You’ll have to transfer in Břeclav and it’ll take about 2 hours. However, for both Brno to Olomouc and Olomouc to Brno, you can take a bus. In this case, it’s much more convenient than the train and can take as little as 1 hour. 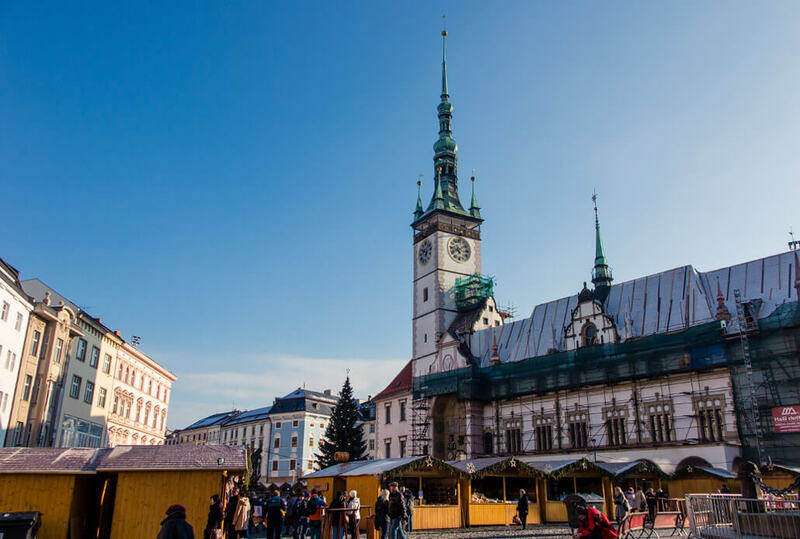 You can also opt for a private transfer from Brno connected with a guided tour of Olomouc. Check the current pricing and availability here. Btw. Here’s a timetable of all trains and buses in the country. Use it to find your ideal connection and then go book it at the chosen provider’s website. Ok, so you travelled from the biggest Czech cities to Olomouc and now you’re looking at where to go next? If you’re itching to check out one of the neighboring countries, there are many exciting cities which are very close! From Olomouc to Krakow, the train takes nearly 6 hours (a direct one). If you don’t mind taking buses, you can make use of Flixbus, which has direct connections and the trip takes just 4 hours. When travelling from Olomouc to Vienna, people usually take the Czech Railways train and transfer in Břeclav. Such a trip takes about 4.5 hours. But recently Leo Express has started running their bus service between the two cities, shortening the travel time to just 3 hours. Currently there’s only one bus per day, though. To travel between Krakow-Budapest-Vienna-Prague, you can also check out this guide on European (night) train trips. Olomouc is quite an easy town to navigate. There’s no metro, but the tram & bus systems work well. Take the tram 2, 3, 4 or 6 to the stop “U Sv. Mořice”. When you arrive, just turn left and you’ll be in the heart of the town. Or, take the tram no. 1, 5, or 7 to the stop “Okresní soud”. From there, take the right and you’ll find yourself on the main square. The tickets can be bought with coins at a vending machine right by the tram stop, or at any newsstand. Or you can walk! It’s actually easy to get around just on foot. Even walking from/to the train/bus station is easy. It takes about 15-20 minutes. The Olomouc city center is charming and walkable. The main Square is called the Upper Square (Horní náměstí), even though it might appear low at the first sight. Many of the sights are centered here. The Upper Square connects towards its top with the Lower Square (Dolní náměstí). 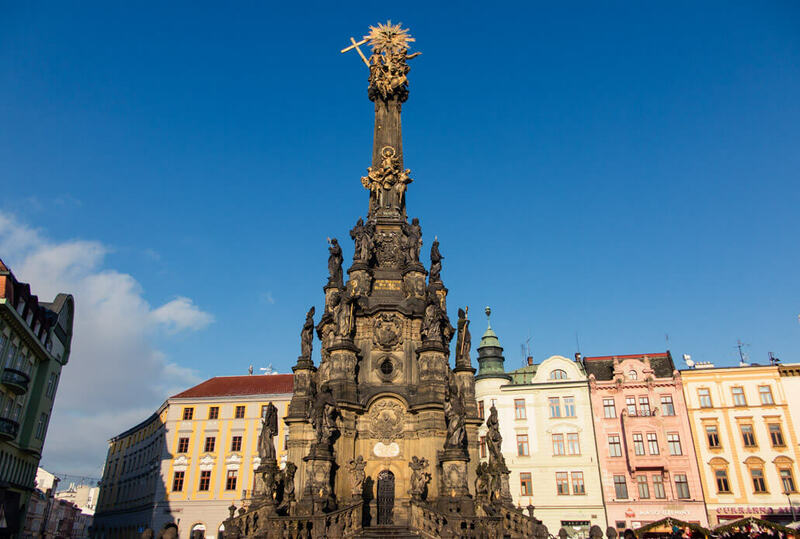 The Holy Trinity Column in Olomouc will strike you as soon as you enter the Upper Square. It’s been on the Unesco World Heritage List since 2000. The sheer size of it is unlike any other columns you’ve seen. It’s so big that there’s a chapel on the bottom! The baroque masterpiece features 18 sculptures of saints, 12 light-bearer figures and 6 relief busts of the apostles. It’s not only the looks and the size of the Holy Trinity Column that makes it so unique. Everyone who participated in the construction process between 1716 – 1754, was a citizen of Olomouc. The local patriotism and the joy that a 2-year plague was finally over, strengthened the people’s inclination towards the Church and thus inspired a tribute in the form of the Column. Holy Trinity Column – look at the size of that thing! Olomouc Town Hall, located right in the middle of the Upper Square, cannot be overlooked either. The Gothic building has served its original purpose, i.e. that of a city hall, for over 600 years. It’s a clear testament to the city’s importance in the past, when it used to be a capital of Moravia. Olomouc held the status of the capital since the medieval times until the 17th century, when the city ‘lost’ to Brno, especially due to the damages incurred in the Thirty Years’ War. If you look closely, you can notice a couple of renaissance decorations on the façade, which were added in the 16th and 17th century. It’s also here, right in the middle of the Upper Square, where most markets, concerts and other fun Olomouc events take place. Even Olomouc has its astronomical clock! It looks very different from the Prague one, though. The clock, built into the façade of the Town Hall, was first constructed at the end of the 15th century, but a legend has it might have happened a few decades sooner. Throughout the ages, it went from having a Gothic appearance to Renaissance and finally to Baroque. The clock got its present looks from a renovation after the Second World War, when it was badly damaged. The renovation reflects the time – the socialist realism gave it a distinct look with a mosaic depicting the Ride of the Kings and working class on the bottom of the motive. 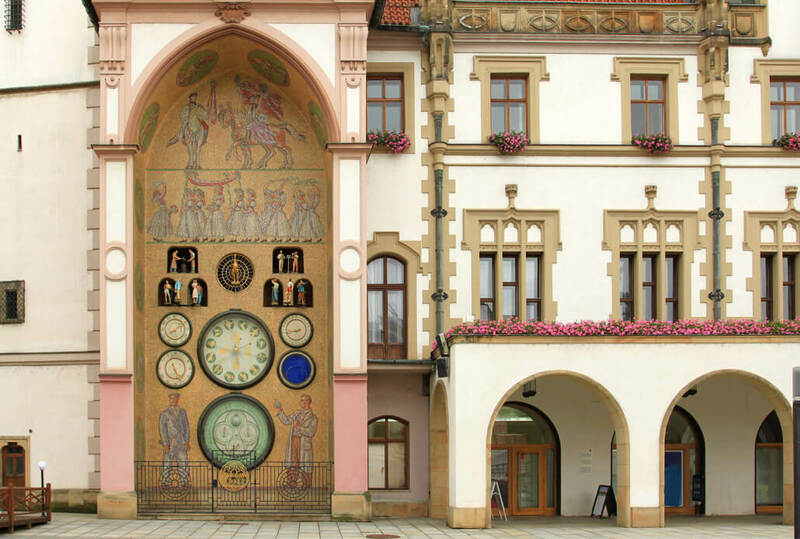 The unique astronomical clock of Olomouc – very different from the one in Prague! 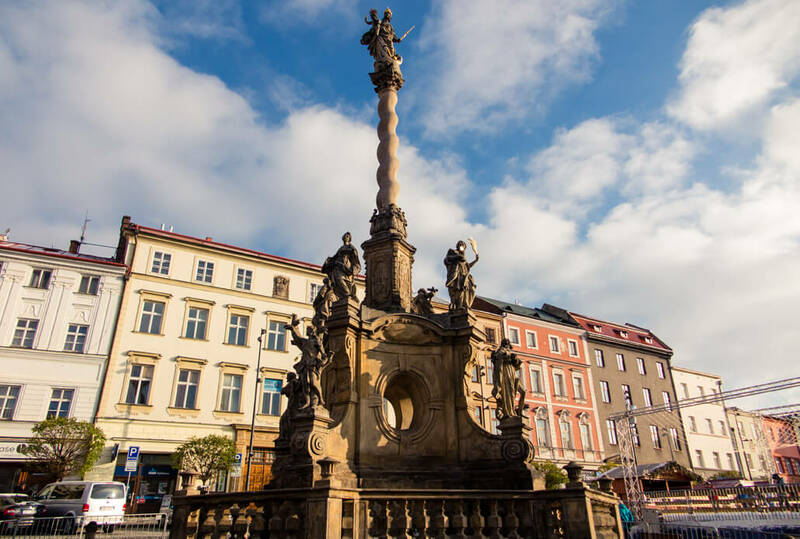 The fountains of Olomouc will peek at you from wherever you walk in the Old Town and should definitely be a part of what to see in Olomouc for every traveller. From Baroque to other styles, from old to new, they’re all worth checking out. 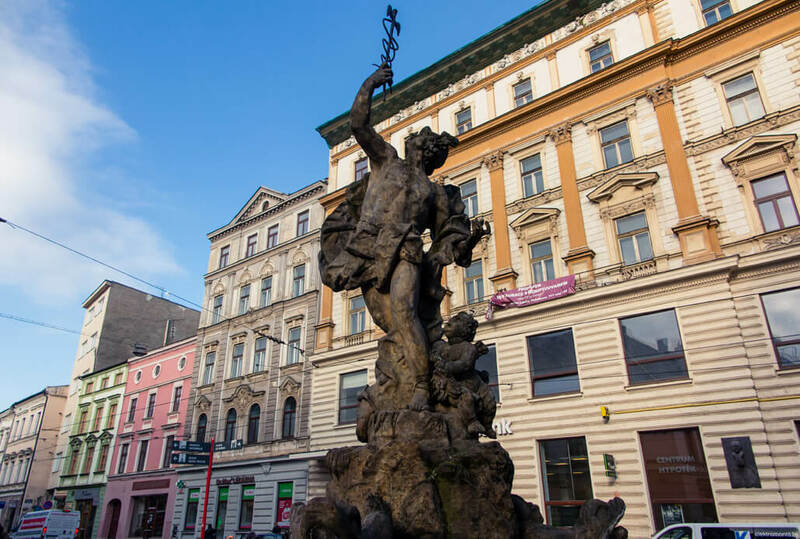 There are 6 Baroque fountains in Olomouc, all dedicated to figures of antique mythology: Caesar, Mercury, Hercules, Neptune, Jupiter and Tritons. They had more than just a decorative function. Constructed in the 17th and 18th centuries, the fountains were built to provide locals with water. The largest of the Olomouc fountains and the most famous one. Standing right next to the Town Hall, the baroque fountain from 1725 represents Gaius Julius Caesar, the legendary founder of the city. Made entirely of sandstone, this particular fountain built in 1727 is considered the best of all the Olomouc Baroque Fountains, especially from an artistic and technical perspective. It depicts Mercury, God’s messenger. This fountain was originally built (in 1687) on the spot of the Holy Trinity Column, but was later moved. I’m sure Hercules, the legendary hero, doesn’t mind the current position right by the Astronomical Clock. The oldest fountain in Olomouc and the first one of the 6 baroque fountains was erected in 1683. You can find it on the Lower Square. See how Neptune is holding his trident so that it faces downwards? That’s a sign to protect Olomouc. The most recently built Olomouc Baroque Fountain from 1735 originally had a statue of St. Florian positioned on top of the pedestal. However, to match the other antique-inspired baroque fountains, the statue of Jupiter later replaced the original. You’ll find it also on the Lower Square. A work of art by an unknown sculptor, the Tritons’ Fountain is located at the Republic Square (Náměstí Republiky). The detailed composition shows two seamen carrying 2 shells with a boy and water dogs. The fountain draws inspiration from the famous fountain “del Tritone” in Rome by Bernini. 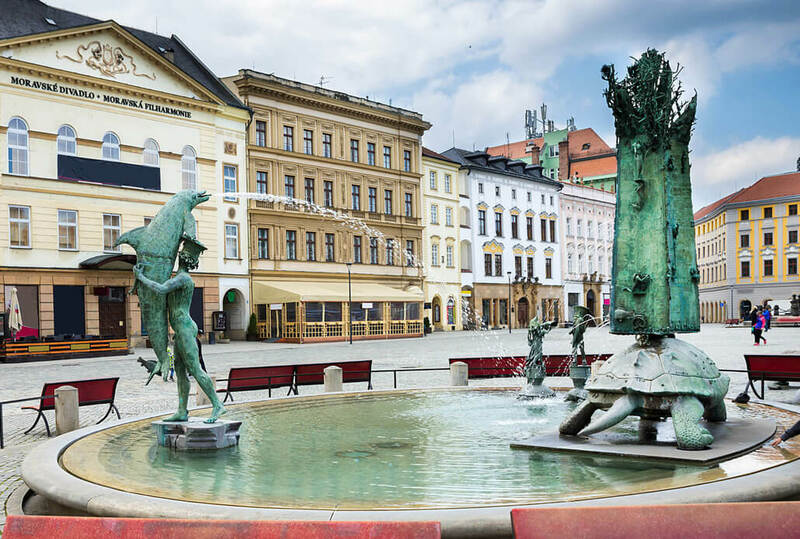 The last and modern addition to the Baroque fountains in the city, the Arion Fountain Olomouc was constructed only in 2002, but plans for its creation have been around even since the Thirty Years’ War. The fountain features an ancient tale of a Greek poet Arion, who was saved by a dolphin. If you have kids with you, let them climb on a turtle statue next to the fountain. 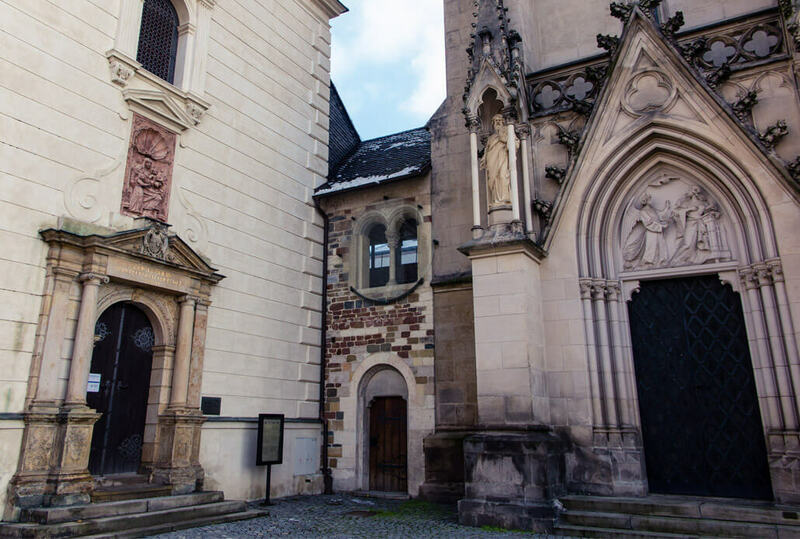 Also known as St. Maurice Church, this Gothic masterpiece constructed at the beginning of the 15th century received a Baroque makeover in 1709, after a fire damaged the interior. In 1745 the largest organ in Central Europe was placed there. With over 10,000 pipes, it’s currently the 7th or 8th largest in Europe. The Church of St. Moritz Olomouc participates every September in the International Organ Festival. It must be quite an experience to hear the organ in its full glory! Come here for a peaceful encounter, admire the organ, and if time, weather and staff permit, go climb the tower. There’s supposedly a beautiful view of the Old Town. The first mentions of the Olomouc castle date back to 1055. The castle itself, significant especially in the Přemyslid era, formed only a part of the castle site located on Wenceslas Hill. As of today, only a few remnants of the actual castle remain, most of them visible from the northeast side. Those are parts of the stonewalls and outer walls complete with Romanesque windows and a round tower. To get the best glimpse of how the castle looked and operated, head to the Archdiocesan Museum on the castle grounds. You’ll also find a permanent exhibition showcasing the Olomouc spiritual culture. If you visit on a Wednesday or a Sunday, you won’t need to pay for the entrance. It’s here where Wenceslas the III., the last representative of the Přemyslid dynasty, was murdered in 1306. That set off a series of battles to acquire the Czech crown, which was eventually ended by John of Luxembourg who rose to the throne in 1310. The Olomouc Castle complex was visited by Mozart, who composed his Symphony No. 6 in F major in Olomouc, as well as by e.g. Mother Theresa and Pope John Paul II. See the little wedged building in the middle? It was a part of the Olomouc Castle. 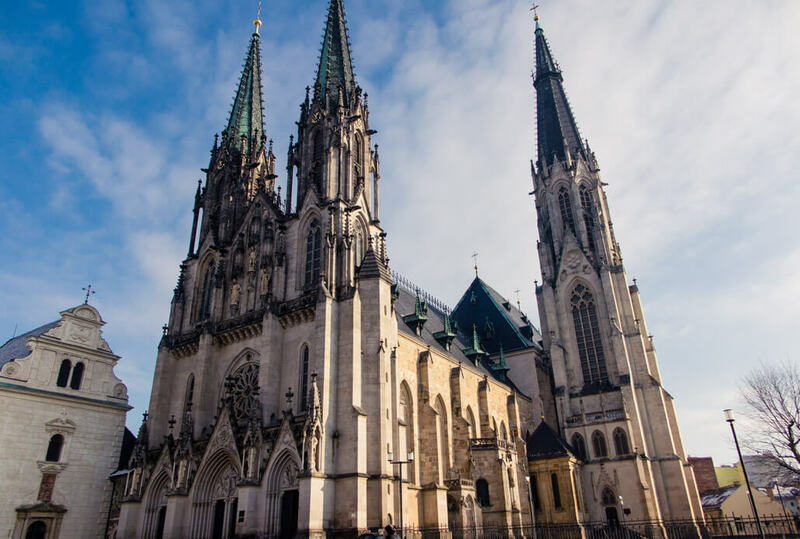 When you arrive at the Wenceslas Hill, this Olomouc Cathedral is what you might mistake for the Olomouc Castle. Indeed, it formed a part of the castle complex and was added here in the early 12th century. 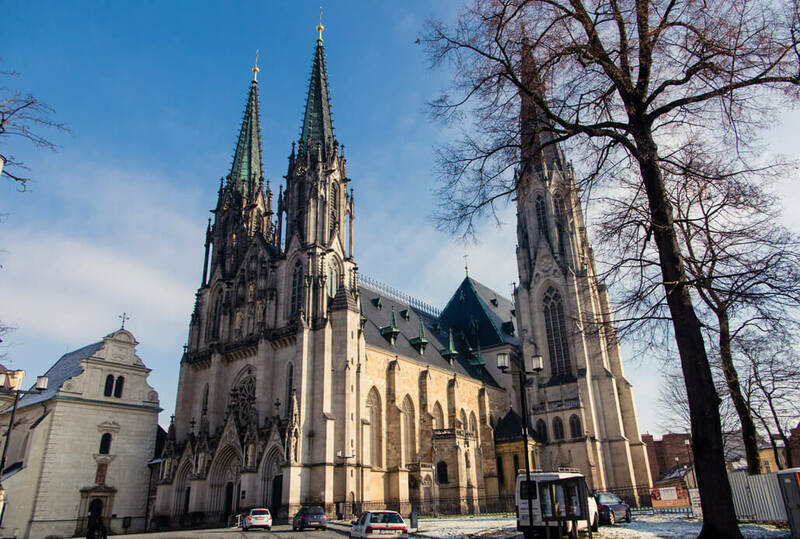 The Saint Weceslas Cathedral Olomouc is as majestic as Prague’s St. Vitus’ Cathedral. Two church towers form the front of it and the third one behind is actually the highest in Moravia and second highest in the Czech Republic. Originally built as a Romanesque basilica in 1141, it underwent several modifications and renovations, especially after a fire in 1265, when the Cathedral got its Gothic coat. You can go inside, join a free guided tour and even listen to the organ. More info can be found here. A dominating feature of the Lower Square, the column was built to commemorate the plague that struck Olomouc in 1713-1715 and its victims. Marian Plague Column on the Lower Square – see the corner of the ice rink next to it? This fully Baroque church hides on a small hill above the Lower Square. 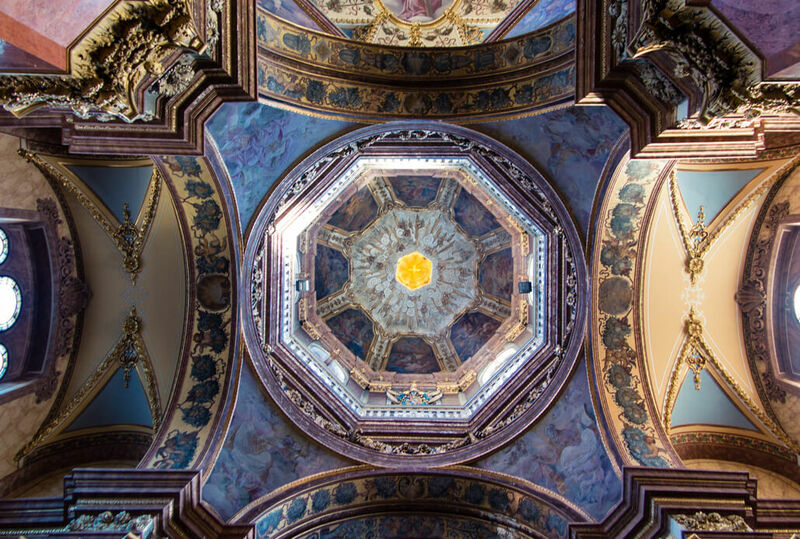 While not too breathtaking on the outside, you should check out the ornate Baroque interior. It’s also possible to climb to the tower, where the church’s mighty bells are displayed. Since you can’t take in the beauty and the size of this church (the streets around are too narrow), you need to step inside! Just near the St. Michael’s Church there’s a small chapel dedicated to St John Sarkander. The exact address is Mahlerova 19. John Sarkander was a catholic priest who was tortured to death. The chapel is tiny, but beautiful, and depicts John Sarkander’s story. If you’re still not fed up with churches, this Baroque gem is worth visiting too. The typical Jesuit style church has quite a detailed interior and a powerful-looking exterior. 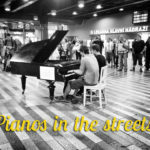 You’ll find it on Denisova street. 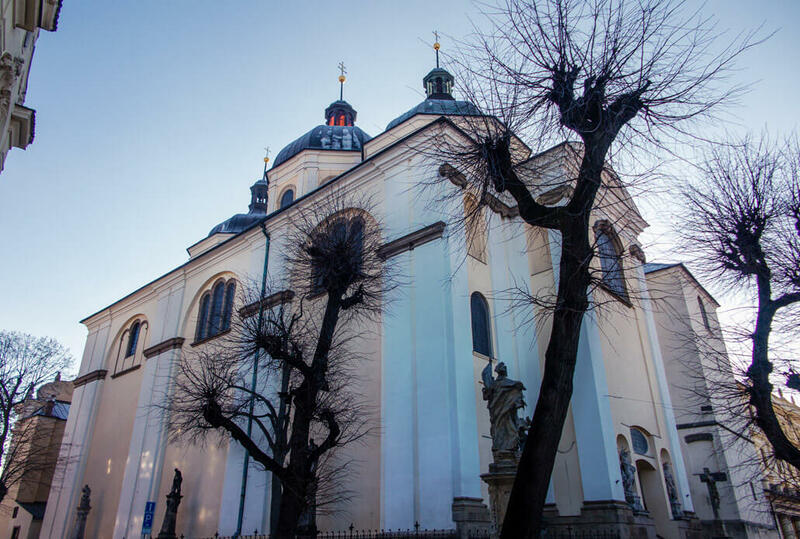 Church of the Virgin Mary of the Snows – another of the many Olomouc gems! There’s no point in denying it: Olomouc is a university town. Some 20% of Olomouc population are students! That’s the highest density in the Czech Republic. The main Olomouc University is the one of Palacký and it’s particularly strong in the fields of art and humanity studies. Palacky University is the second oldest University in the Czech Republic (after the Charles University in Prague). It consists of a number of buildings and campuses dispersed around the town. You can see a few of them around the city center too. Some of the buildings the faculties are housed in, are of a significant architectonic and historical importance. E.g. the Arts Center is located in a former Jesuit Convent. The Baroque building includes a Chapel of Corpus Cristi with one of the most valuable church interiors in Moravia. If you’re lucky, you can come across a concert being held in the Jesuit Convent. Find it on the address Univerzitní 3. Also the central library is definitely not a shabby space. The grand armoury is a beautiful historical building, allowing for the students to absorb knowledge better (it works like that, right?). Find it on Biskupské nám. 1. If you like checking out impressive palaces, you shouldn’t miss out on the Archbishop’s Palace in Olomouc. The Palace is a textbook example of Early Baroque in Moravia. It hasn’t only acted as the seat of local bishops and archbishops, but has also witnessed important events in the city’s history. It’s e.g. right here where Emperor Franz Joseph I took over the throne. The building can be found on Wurmova 9. Edelmann’s Palace: Two gothic houses combined into one Renaissance Palace which you can find on the Upper Square opposite the Astronomical Clock. Villa Primavesi: An interesting Art Nouveau Villa built for a local banking family. Also the famous Austrian painter Gustav Klimt participated in the villa’s decoration. Also, don’t miss the houses in the Lower Square with symbols on them. There’s a black horse and a golden deer that served as identifiers back before the numeric system was introduced. If you keep your eyes focused on the buildings around you, you’ll see some real gems. Museum of Modern Art Olomouc: One of the best museums in Olomouc, housing visual art from the Czech Republic and abroad. 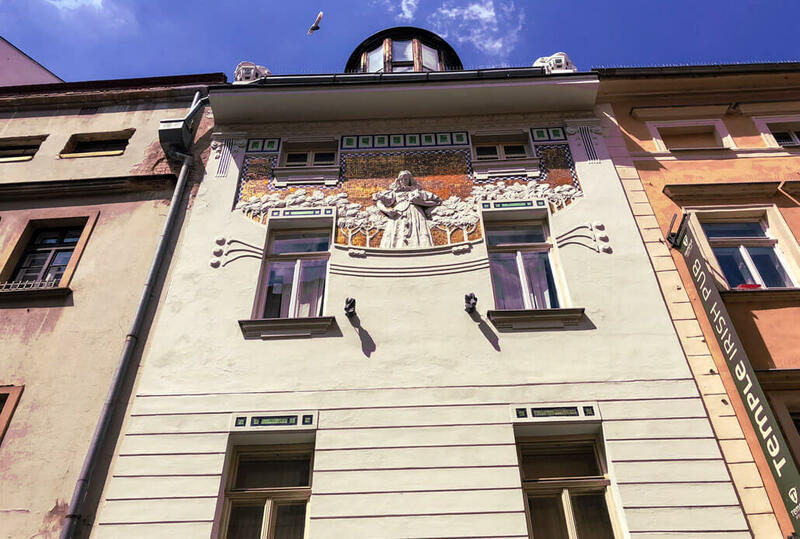 It’s located in a beautiful Art Nouveau house on the Republic Square (the exact address is Denisova 47). Wednesdays and Sundays are admission-free! Regional Museum Olomouc: To discover more about Olomouc and its surroundings from prehistoric until modern times, head to this museum. You’ll find it in a former church on the Republic Square 5. Each Olomouc museum is opened every day except Monday. One last architectural gem worth seeing, even though it’s not in the old town, is the Hradisko Monastery. Have you ever seen El Escorial, the historical residence of the King of Spain just outside Madrid? Hradisko is often compared to it. There was a church/monastery on the site already in the 11th century, but it suffered throughout several wars. The monastery compound bears influences of a few different architectonic styles, of which Baroque might be the most recognizable. Hradisko is currently used as a hospital complex. It takes just about 30 minutes to walk to Hradisko from the city center. You can also take a bus – no. 15, 20, or 21. This church, located near the train station, puzzled me ever since I was a kid! It just looks a bit out of place. Nevertheless, this is Olomouc’ main Orthodox Church, named the Church of St. Gorazd. 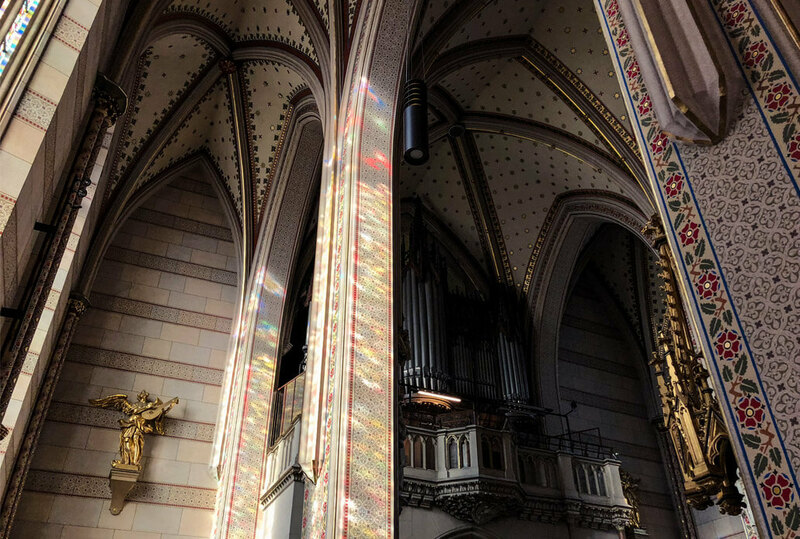 It was built in 1939 and later consecrated to St. Gorazd, a bishop who was executed by the Nazis for hiding the paratroopers who assassinated Heydrich, the German Nazi official. Even though Olomouc doesn’t have its own big-name brewery, there’s a lot of microbreweries operating in and around the city. And what’s even better – you don’t have to just drink it, you can bathe in the golden brew! The only one I know about is located right in the city center – the St. Wenceslas Microbrewery. If you want to come bathe in the beer, make your booking here. 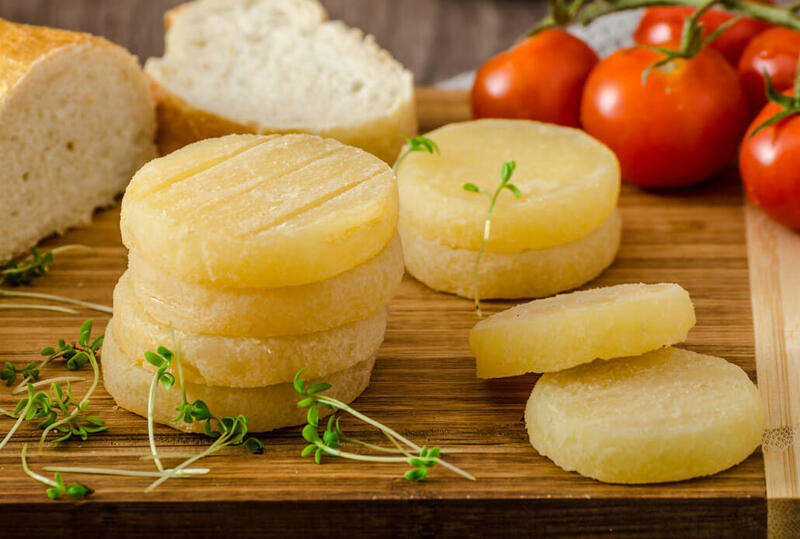 Olomouc, even to other Czechs, is mainly famous for its special smelly cheese called Olomoucké syrečky (or tvarůžky). In reality, it’s produced in the village of Loštice outside Olomouc, but somehow it became the symbol of Olomouc. It’s so special that it even received its own EU trademark! 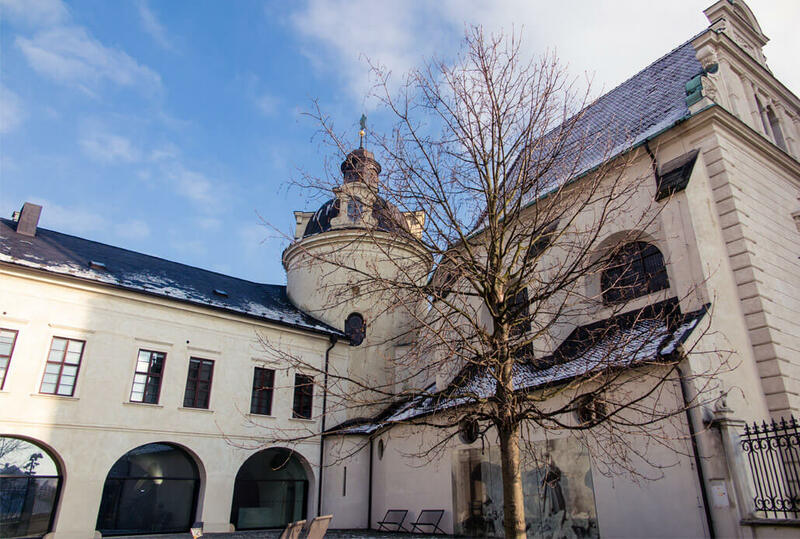 If you’re interested in tvarůžky’s history, you can visit a museum about it! You’ll find it in Loštice. Actually, you can taste the tvarůžky without having to leave Olomouc – either buy some good old tvarůžky in a supermarket or head to the Tvarůžková cukrárna (=confectionery) on Denisova 13. There, you’ll be able to taste more sophisticated sweet creations made out of tvarůžky. I assume the taste is more pleasing to the senses than the full-on original cheese. The cheese looks quite innocent, but smells SO bad! 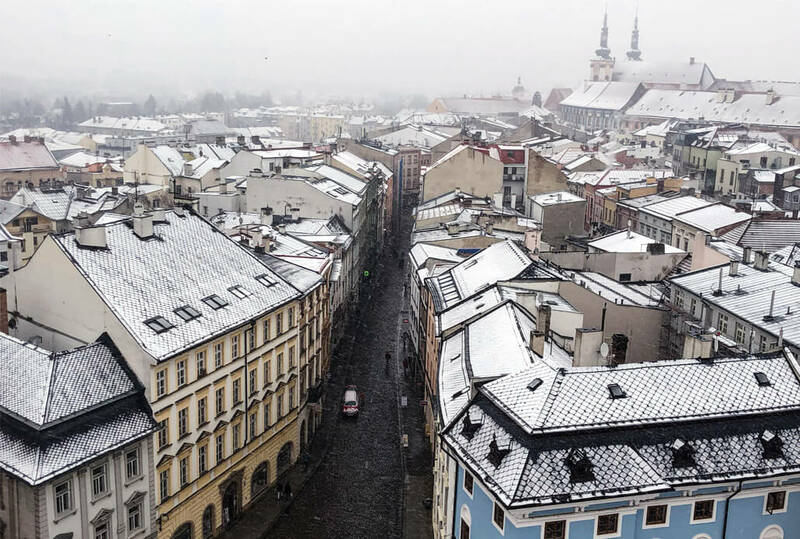 To see Olomouc from a very different perspective and at the same time learn about its history, Ololoď is a great idea. 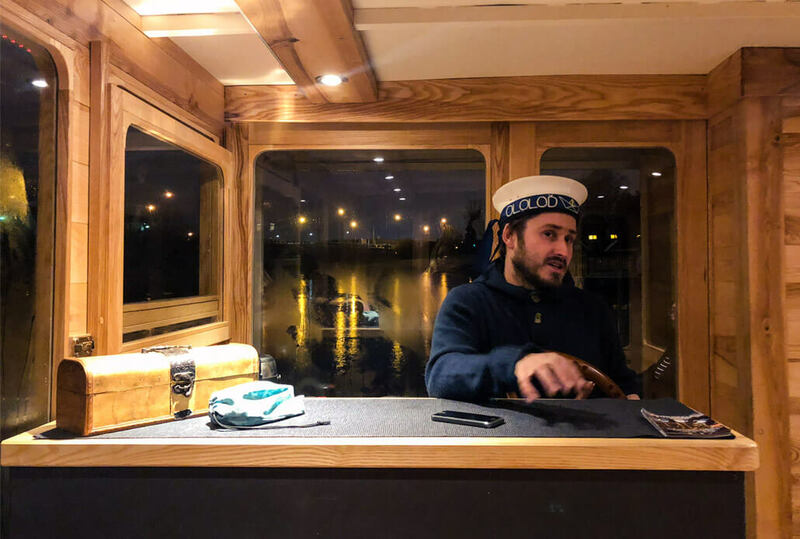 Started by a local enthusiast who loves boats, this offbeat boat ride won’t wow you with sights, but it’s a perfect addition to seeing the city and learning about it from a local. I can highly recommend it! We took it once in winter and even though it got dark already, we had our eyes peeled on our guide who warmed us up with a mulled wine and a heater (not enough of the wine though, because the people before us were too ‘thirsty’). It’s currently the only boat service in Olomouc. Find more info here. The same guy operates a unique beer bike in Olomouc. But it’s different from the ones you’re used to seeing in Amsterdam and such places. This bike combines drinking with history and stories, and it can get wild depending on the crowd. In winter, they serve mulled wine (and warm blankets!) instead of beer and it’s a great fun! Details can be found here. The unique underground restaurant looks both old school and yet old class stylish. They make their own beer and the food is just as it should be. Try some typical Czech meals, e.g. the garlic soup! And what kind of Olomouc food would it be, if they didn’t have the tvarůžky. You’ll find it in a few meals – I had it just in the garlic soup and it was all yum! A great pub/restaurant to grab a quality lunch for a good price. That’s Plan B – on a weekday, you’ll meet only locals rushing in from their offices. Typical Czech food and beer. Lots of beer. And burgers. Service can be hit or miss. Not to be mistaken with the microbrewery above, this restaurant serves typical Czech food and has Pilsner on the tap. This restaurant says they specialize in old Bohemian food, adding burgers and pizza to their menu. It’s a bit of a mish mash, but locals flock this place for lunch. The prices are good and the food is decent. However, the service can be slow. My Olomouc friends warned me of double pricing here, but I haven’t experienced it myself. A hole in the wall and Olomouc’ take on hipster fries places. I haven’t tried but the fries look great! It seems ideal as a late night snack, especially if you’ve been drinking. Fresh Italian pasta in Olomouc. If you long for Italian cuisine, there’s no better place to go in the city. This place is a real gem! We had one of the most delicious ramen soups! The food seems flawless, the interior is chic and modern and it’s a bit hidden away. What more you could you ask for? The name says it all. Authentic Nepali/Indian cuisine, fresh ingredients, great staff. I never felt the urge to have such food when in Olomouc, so no personal experience here. 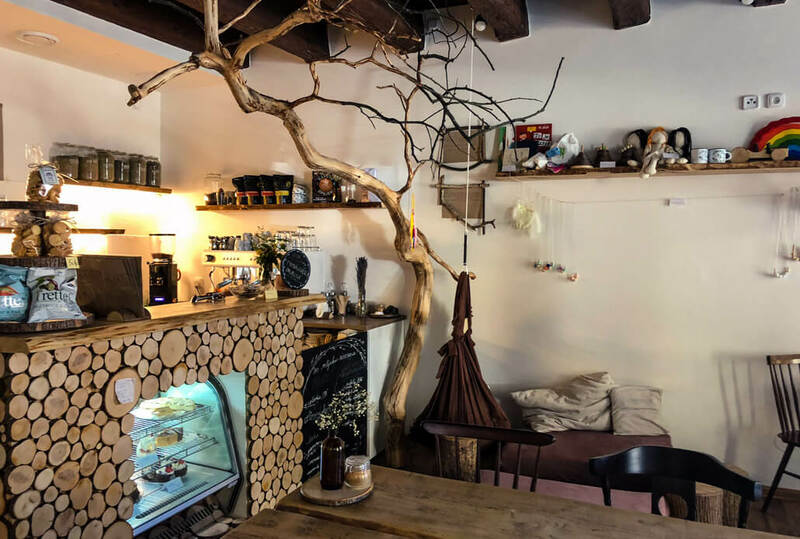 A trendy restaurant/bistro where you don’t have to be afraid to order coffee :) The cuisine is predominantly Italian and the interior is highly stylish. A popular café with a nice clean interior that won’t amaze you, but you’ll get your quality coffee fix here. A cute and comfortable café with a nice little garden in the back. France-themed. A cozy café on the ground floor of Miss Sophie’s Hotel. Old original ceilings and comfy chairs make this café an ideal hangout spot. A nice looking café, often frequented by students. The coffee is good, but don’t expect wonders. Ideal for kids. You have to take off your shoes upon entering, but if you have kids with you, there’s hardly a better place for them to play and for you to have a proper cuppa. 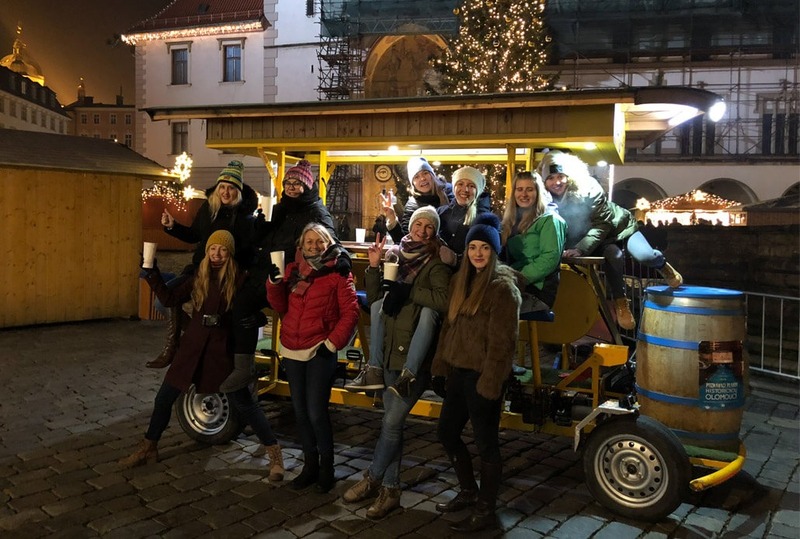 Not surprisingly, Olomouc nightlife is run by students. When students are not partying, the town feels dead. That’s the harsh truth. But if you embrace it, you’re up for a lot of fun! This pub/bar has 6 beers of local microbreweries on tap and seriously stylish interior. You can also taste some typical Czech snacks to have with beer. Their specialty is blue cheese (niva) balls. It’s located on the Upper Square. 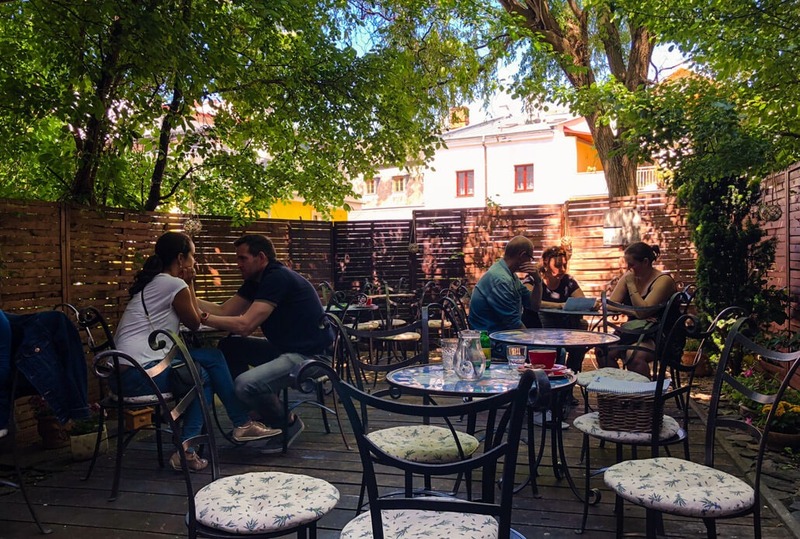 For me personally, the best Olomouc bars with a cool vibe are those located in Masné krámy passage. When visiting with friends at the end of November last year, we’d just walk around, had a beer here and another there, and had fun chatting with a few local students, eventually even playing foosball together :) Masné krámy are located on the Lower Square. If you like nightclubs and want to take the dance floor by storm, head over to Belmondo! They have a couple of resident DJs who pump up the beats every Wednesday, Friday and Saturday. 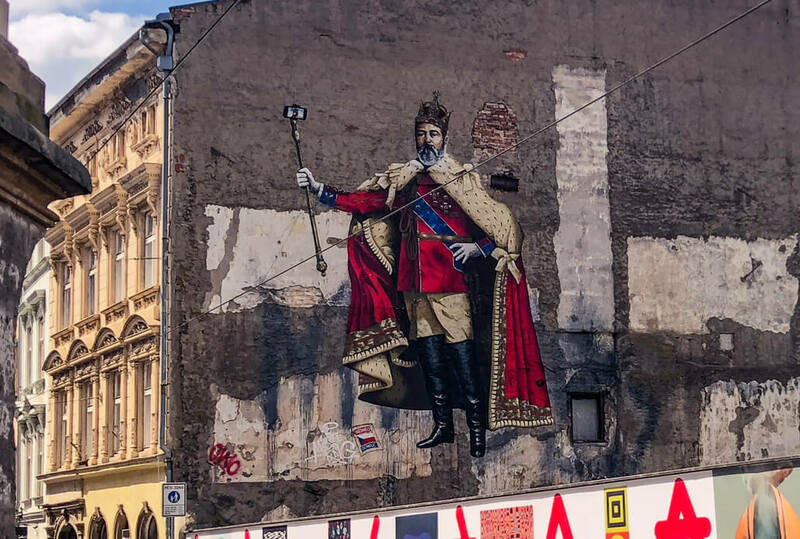 You’ll find it on Mlýnská Street, still in the city center. A legendary disco club that’s been around for ages! I’m not sure what kind of quality music you can expect here but if you find yourself in the city at night, Varna is a sure option any day of the week. The newest Olomouc shopping mall is the closest to the city center. In fact, since parking is free for 4 hours, many people (myself included) just park in this mall and head to the city. Don’t tell anyone! There are 200 shops spread around 3 floors in Galerie Šantovka and it’s full of restaurants, cafés with cakes, a movie theater, a bowling hall… you name it, they have it. This mall used to be the most popular Olomouc shopping center, but then Galerie Šantovka was built. It’s located on the outskirts of Olomouc, right by the highway. It was designed as a reminder of a traditional mill complex. All the shops are thus located on the ground floor. There are frequent buses between the mall and the city center. Charging stations for electric vehicles are also provided. My parents like going to this Olomouc mall the most J Similar to Olympia, it’s located right outside of Olomouc on a highway. There are around 65 shops and a big Tesco supermarket that’s open until midnight. If you’re just looking to go to a supermarket (e.g. to buy the tvarůžky) and need a drug store or a pharmacy, this small shopping center located right in the heart of the town is perfect for that. You’ll find it on the street 8. května, right by the St. Moritz Church. I strongly suggest you spend a few nights in Olomouc, rather than just see it on a day trip. 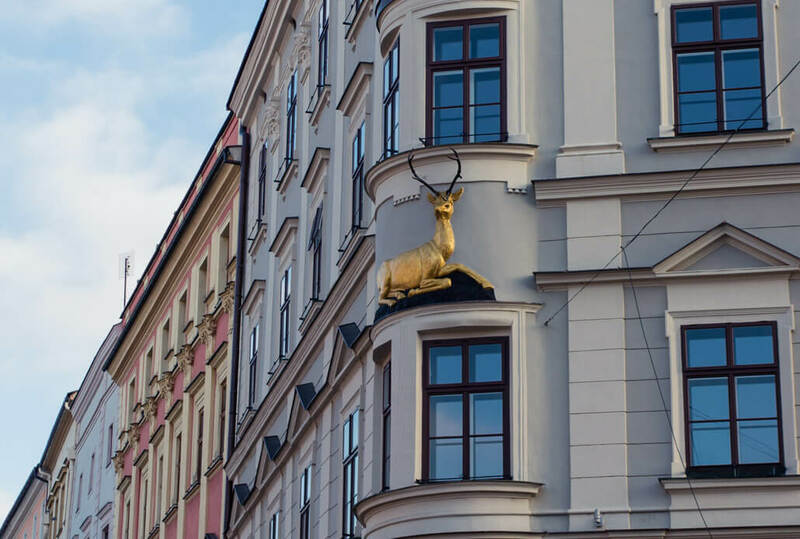 Hotels in Olomouc Czech Republic are plentiful and you’ll be able to find an establishment to suit your taste. 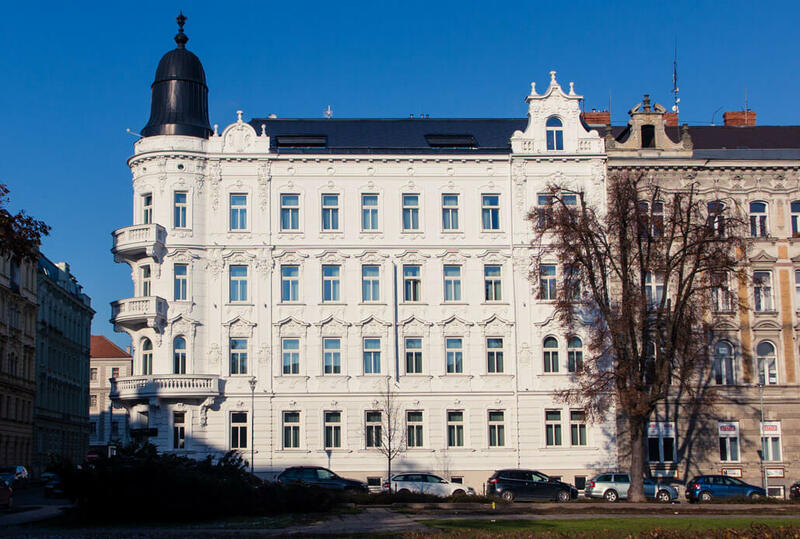 The NH Hotel in Olomouc Czech Republic is part of an international chain of luxury hotels. The quality is guaranteed and there will be no surprises. Click here to see the current prices and availability. Already the façade of Theresian will take your breath away. I stayed in the hotel and especially enjoyed the Nespresso machine in my room. The design was modern and stunning, albeit I prefer cozier interior design schemes. The breakfast was heavenly! See Theresian’s current pricing and availability here. Doesn’t the Theresian Hotel look grand? A quality business hotel, rather than a luxury one. It’s located right by the train station, which can be an advantage or a bit of a disadvantage (if you’re a light sleeper). Check the Clarion’s Hotel prices and availability here. Slightly on the higher-end of the mid-range, at least by Olomouc standards, Hotel Alley is popular especially among business travellers. You’ll find it right in the city center. Click here to check current prices and availability of Hotel Alley. This boutique hotel is my personal favorite, even though I didn’t stay there (yet). I had the opportunity to see two rooms and I heard from a blogger friend of mine that it was indeed wonderful to spend a few nights at Sophie’s. 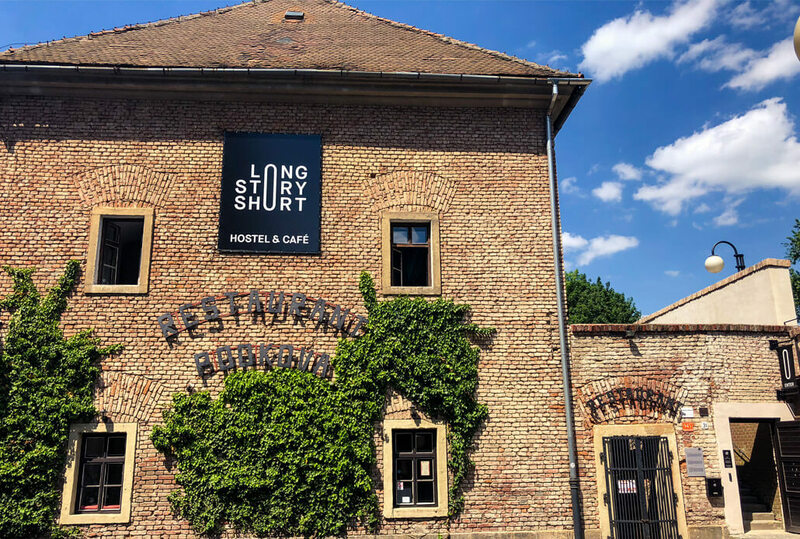 The location is perfect, the interior design is stunning and the whole building was reconstructed carefully taking into account its historic value. There are only 8 rooms in total with a great café on the ground floor. See the current prices and availability of rooms at Sophie’s here. While the design of Trinity Hotel was definitely once grand, nowadays it might feel slightly dated. Still, I enjoyed staying in this Olomouc hotel, felt comfortable in the room and the breakfast was decent. Other guests have praised the wellness center. See current pricing and available rooms at the Trinity Hotel here. 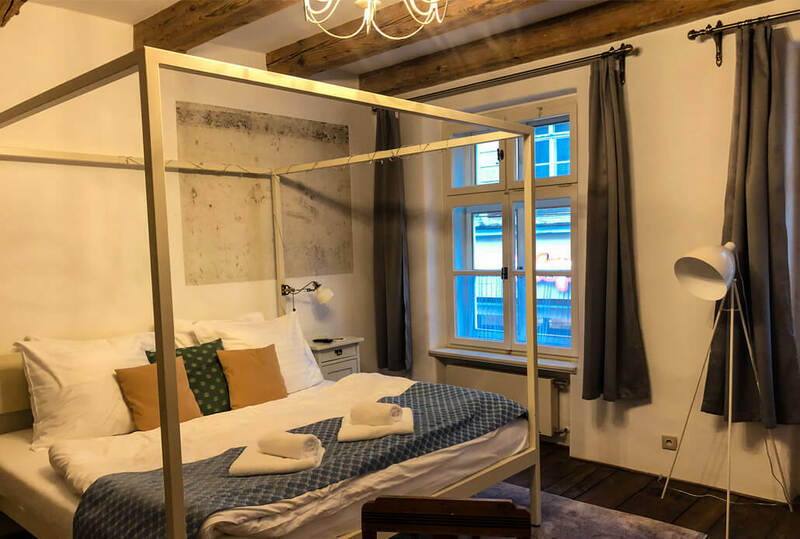 This Olomouc hostel, formerly known under the name Cosy Corner Olomouc, radiates coziness – from the furniture, to the atmosphere, to the staff. You’ll just feel good there. You can choose between a dorm and a private room. Click here to check the up-to-date prices and room availability at Poets Corner. One of the newest additions to Olomouc hostel scene – a trendy hostel with a beautiful minimalist design. Choose between a dorm or a private room and make use of the delicious breakfast and a cute café on the ground floor. Check the current prices and availability at the Long Story Short Hostel. This tiny hostel has opened its doors only since May 2018. It’s centrally located and the first guests have praised the cleanliness. Before booking, read through the newest reviews, just in case. See the current pricing and availability of TimeOut MiniHostel here. Yes, you can stay in an apartment too! Check the Top 10 Apartments by Booking.com. 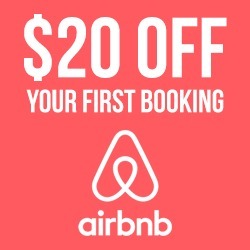 Or, if you prefer Airbnb, see apartments here (if you haven’t signed up for Airbnb yet, please do so here via my referral link – both you and me will get a travel credit!). See? Olomouc accommodation options are numerous and it’s only up to you to choose what would fit your style and budget. Czech Republic is a small country, so the weather is more or less the same everywhere. With that being said, it’s true that Moravia, and especially the Haná region in which Olomouc is located, suffers from heat waves and lack of rain more often than other parts of the country. There’s often snow in winter and the two summer months can turn very hot – over 30°C (86°F) is almost guaranteed. Recently, though, the weather has been less predictable. See temperature averages for Prague winter in my post here. 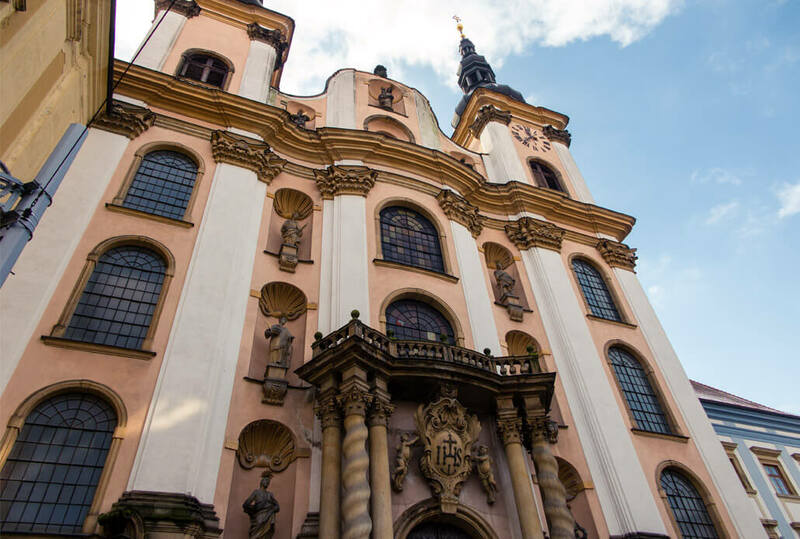 Check out also this list of things to do in Olomouc from my fellow bloggers. 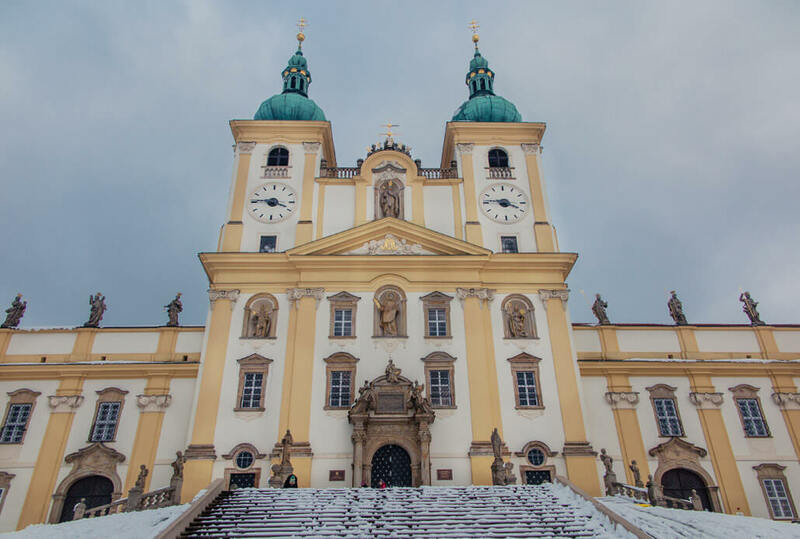 The Holy Hill, located on the outskirts of Olomouc, has been a pilgrimage site for centuries. 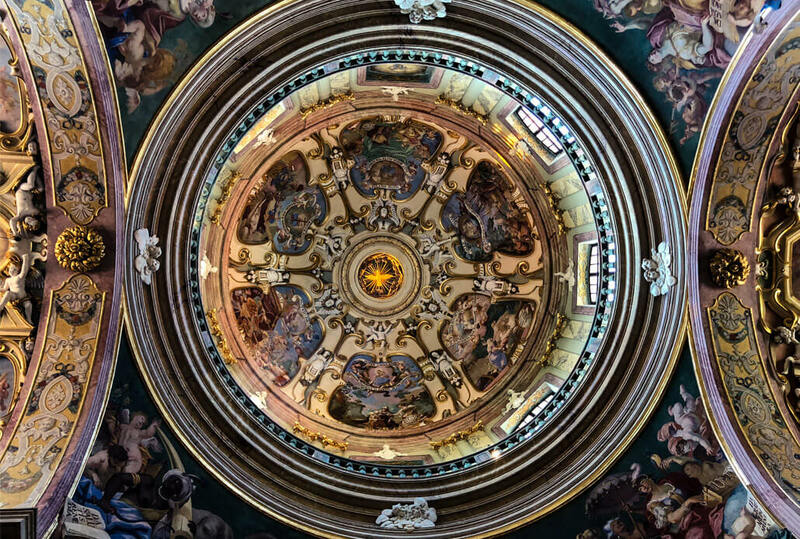 Right on the top of the hill stands a monumental Baroque Basilica – the Church of the Visitation of the Virgin Mary. It was built in the 17th century and features an exquisitely decorated interior. In 1995, the Church was consecrated by the Pope to become a Basilica Minor. When you visit, be respectful to the surroundings. The area is an important pilgrimage site, and there’s also a hospice on one of the streets behind. A little further up above the Basilica, there’s a zoo with some beautiful forests behind it. You can get to the Holy Hill by taking the bus no. 11 from the train station and getting off at the stop named “Svatý Kopeček – bazilika”. Basilica Minor on the very top of the Holy Hill.. on a clear day, you can even see it from Olomouc! 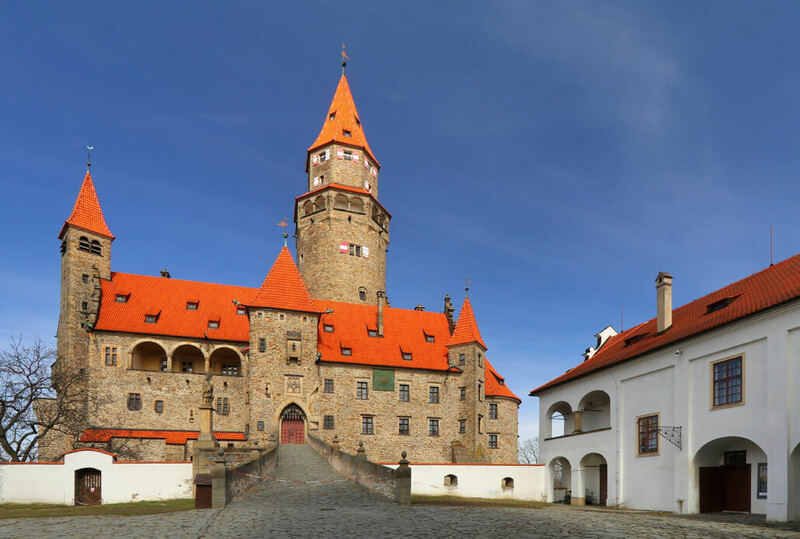 Located 28 km (17 miles) northwest of Olomouc lies the romantic castle of Bouzov. Originally a fortress built in the early 14th century, it was named after its first owners, the aristocratic Bůz family. Currently mostly of Renaissance style, you can also find Gothic features on the castle. There are several different tour circuits that you can go for when visiting the castle. I would recommend mainly heading up to the tower, if it’s open. Apart from the tower, don’t forget to check out the two drawbridges and a portcullis (= sliding metal ‘gate’) – all fully functional to this day. Travelling from Olomouc, take a bus to Litovel (it’s a nice town too, so walk around if you have time), and then another bus to Bouzov. The travel time should be just below 2 hours. A trip by car is much shorter – just 30 to 50 minutes. Here’s Bouzov Castle official website. Just one photo and you’re convinced the Bouzov Castle is well worth seeing! Right? Would you like to go to a beach while in Olomouc? If so then you’re in luck as there’s a lake nearby! 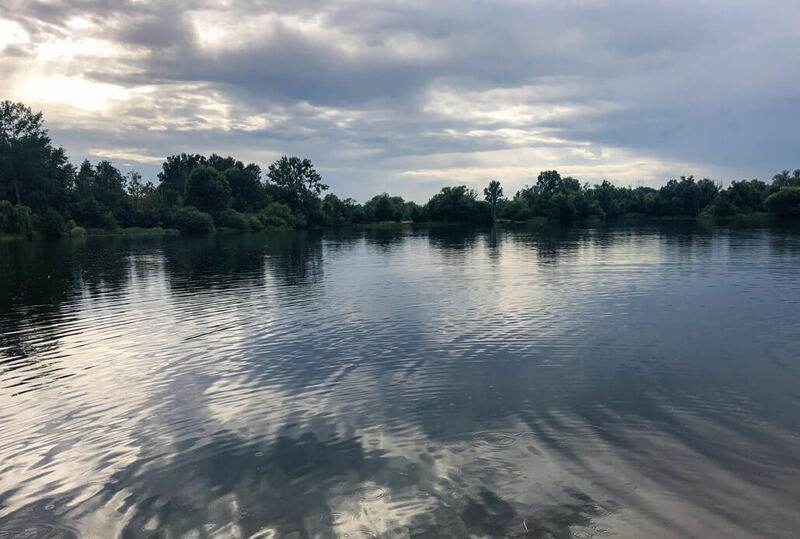 This Olomouc lake is located just 5 km (3 miles) from Olomouc and is an ideal swimming pastime for locals and daring travellers. The whole area is quite lively and there are frequent events organized there. If you don’t feel like having a soak then have a meal instead! There’s a restaurant right on the shore. Don’t confuse the lake with the city of Poděbrady located in Bohemia! This lake can be found near the village of Horka nad Moravou. It’s just a 10 min drive from Olomouc and about 20 minutes by bus from the city (no. 18 or 20 running through the city centre). You can even walk there – in that case you’d follow the stream Mlýnský potok and it should take about an hour. There’s actually way more to see around Olomouc. So much that I might write a separate article on it :) Stay tuned! 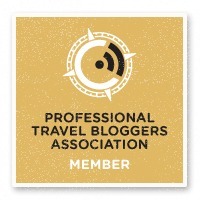 Thank you so VERY much for the wonderful post about my adopted home! An amazingly thorough and great article about so many things here, and great info and recommendations, too! I came and stayed here many years ago, and after coming back to the city multiple times, I fell in love with it and eventually settled here. 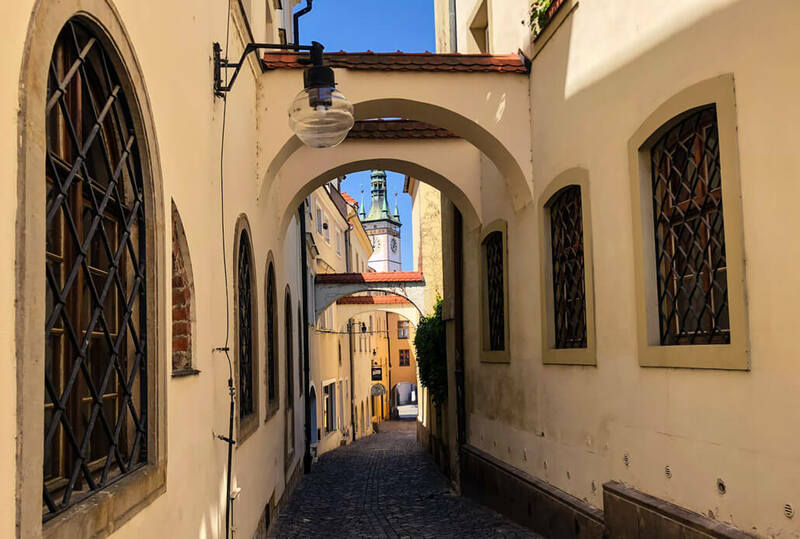 This article is a superb intro to anyone looking to visit Olomouc and the Moravian region … Thanks Again! Thank you Ian, glad to have the article approved by a local :) So you run the Poets Hostel? Hehe, thank you and greetings to Olomouc! Hello, thanks for this guide which is very interesting. 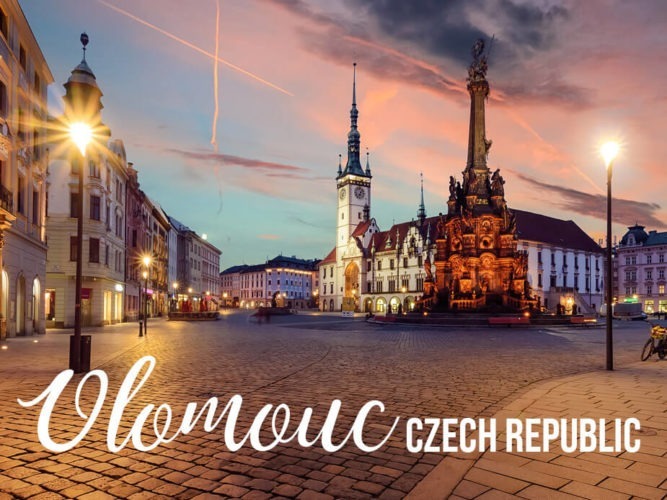 I am a French student and I am going to study to Olomouc next semester. Would you have any recommendations to find an apartment please? Hello Hannah, you can try http://www.spolubydlici.cz/index.php?setlang=en but otherwise I’d go through the student channels, I think you can find cheaper places through some university listings. I have no access to those, since I’m not a student anymore :) Good luck!